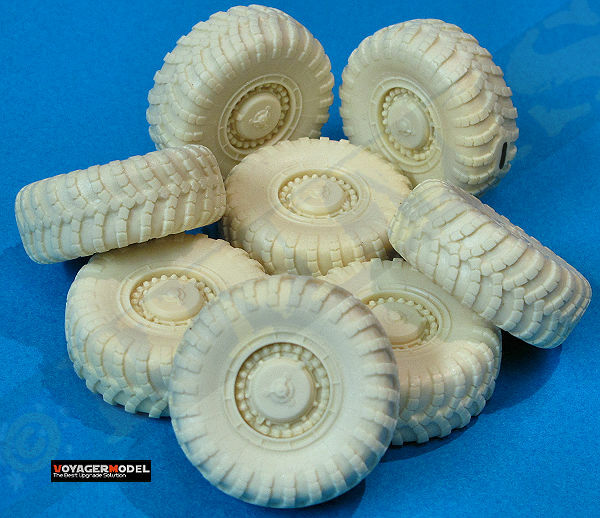 Many modellers like myself like to buy aftermarket resin wheels for vehicle kits to 1. Improve the detail and 2. because they don't particularly like the vinyl type wheels supplied with the kits being not the easiest to paint and weather. Might come down to personal preference like most things but there you are. All measurements done with electronic callipers and another thing I noticed was a small variance in diameter between the wheels in a particular set given the nature of resin but this was only marginal and probably not noticeable on the assembled kit. 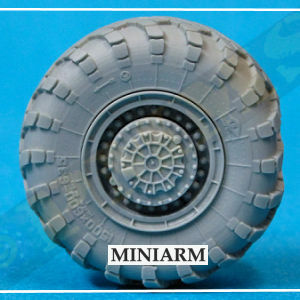 Actual MAZ-543 wheel dimensions are: 1500x600-635 which in 1:35 scale is 42.85mm in outside tyre diameter, rounded to 43.0mm for this exercise. Dragon: don't have the kit on hand at present, sorry. 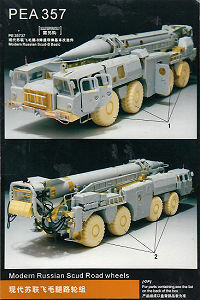 Note; the initial Scud-B kit had the early style tread pattern (centre left) while subsequent kits have been updated with the later style tread pattern (centre right). 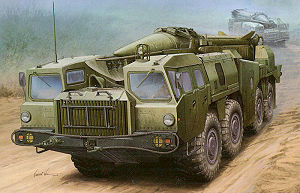 Def Model Sets DW35056, DW35057. 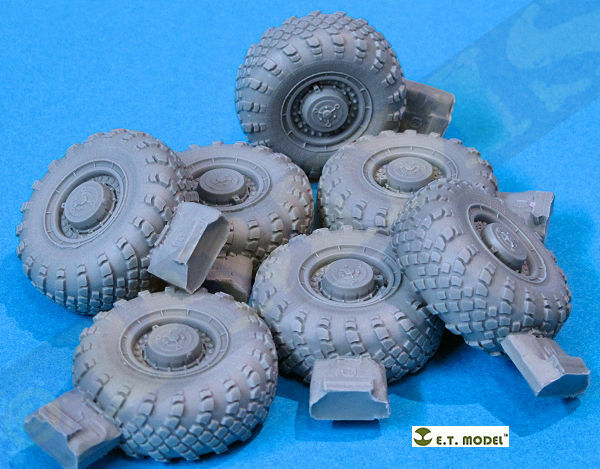 Both sets consist of eight wheels cast in light grey resin with very cleanly cast tread and hub details with the only clean-up being the small casting plug to be cut away. The sets also include hub painting masks to aid in that job. Set (1) DW35056 is the later style tread pattern while set (2) DW35057 is the earlier style tread pattern, this is most applicable to the Scud-B kits as most of the later vehicles use the later style wheels, although many of the earlier vehicles still in service would have been fitted with the later style when needing a tyre change in any case so unless modelling a specific vehicle with the early style tread pattern (2) then set (1) would the appropriate choice. Dimensionally the tyre diameter averages out to exactly 43mm making these wheels the only ones' spot for size out of all those looked at. The tread pattern is very well done with crisp details and is also 'handed' meaning that the tread chevron faces downward on each side of the vehicle when looking from the front and to this end there are two different pattern wheels in the set to use on the left or right side for the tread pattern to be aligned correctly. Each wheel has a letter A,B,C or D embossed on the casting plug with A,B for the left side and C,D for the right side, so take note of this before cutting away the casting plug. The other thing to note is that the sidewall and hub detail is aligned differently between wheels A,B and C,D in relation to the ground contact area so they are not all the same when fitted to the kits. The hub detail is also very well done and while the wheels were initially designed for the Dragon kit they can easily be adjusted to fit the other kits without much effort. The wheels also include side wall "bulging" and a "flat spot" at ground contact to give the weighted tyre look and as mentioned the hub details varies so they don't all look the same when fitted to the kit. 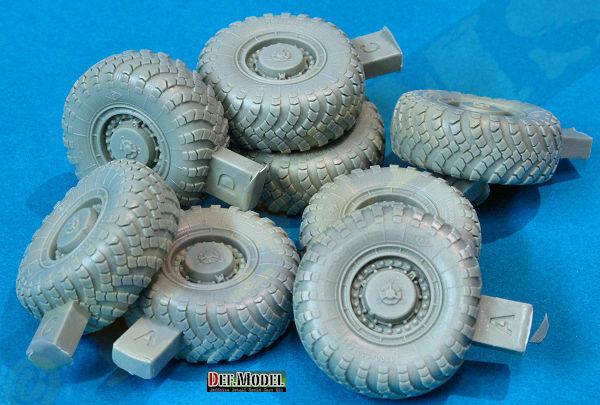 DEF Model resin wheel details; Note the early tread pattern (centre left) and later tread pattern (centre right). 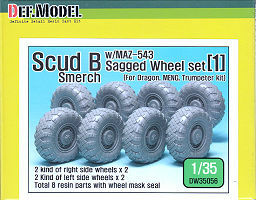 This set designed for the Meng kit and the eight resin wheels appear basically to be resin reproductions of the Meng kit wheels having the later style tread pattern and the same level of detail and are the same basic size, each wheel has a casting plug to be removed but there are also some fine mould lines around the centre of the tread to be removed, this varies between the wheels as is the nature of resin casting. There are some blemishes around the rims where the vinyl tyre wasn't seated properly when the cast was made but again this varies between wheels with some cleaner than others, the worst incidences are around the inside rim so will be hidden when fitted to the kit thankfully. They are cast perfectly round without any 'bulging' and just a small 'flat spot' resulting from cutting away the casting plugs. 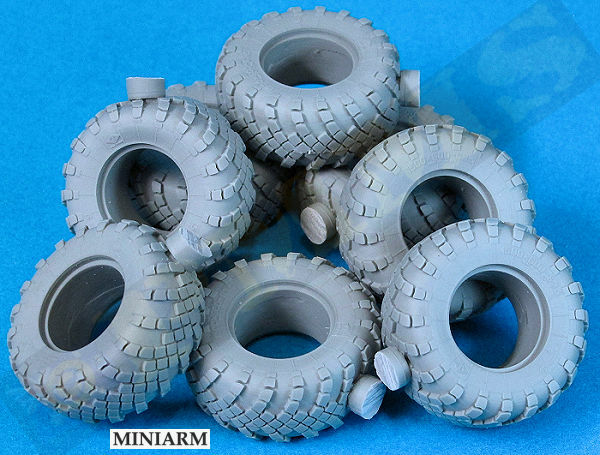 The average diameter of the wheels is 41.5mm and as the kit wheels are 42.2mm how can this be you may ask if they are resin reproductions of the kit wheels? Well as mentioned this 41.5mm is an average figure with measurement of the different wheels and different spots on the same wheel differing quite a bit. They actually varied between 42.1 to 40mm as is the nature of resin casting and I took over a dozen measurements at different spots around the wheels to arrive at the average. So overall the wheels are an average 1.5mm too small in diameter which may or may not be an issue depending on your viewpoint? One thing is each wheel has the hub orientated differently to the ground contact plug point so they don't look the same on the kit, there are also different wheels with the tread orientated to represent the handed tread pattern, unfortunately in my set there were five wheels orientated for the left side and only three for the right side meaning one of the right side wheels will have the tread facing the wrong way. I'm assuming this is just a quality control thing and other sets won't be the same? 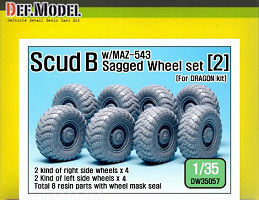 Being designed for the Meng kit if you wanted to use these on the other kits some minor mods will be needed to fit but nothing too difficult as with the Def wheels. One small issue is the tread block pattern segments are not as well defined in some places compared to the other wheels. Wheel details, later tread pattern. 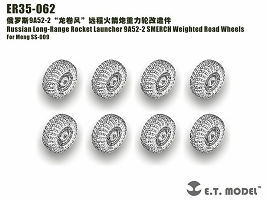 This set is also designed for the Meng kit and like the ET Models set the eight resin wheels appear basically to be resin reproductions of the Meng kit wheels having the later style tread pattern and the same level of detail and are the same basic size except for the inclusion of a largish "flat spot" and minor sidewall bulging. The casting is cleaner than the ET wheels without the central mould lines and there are just three small pour attachments to cut from the rear shoulder of the 'flat spot'. The average diameter of the wheels is 41.0mm and as the kit wheels are 42.2mm you again might ask how can this be? Well as before this 41.0mm is an average figure with measurement of the different wheels and different spots on the same wheel differing quite a bit. They actually varied between 41.5 to 40mm and I took over a dozen measurements at different spots around the wheels to arrive at the average. So overall the wheels are an average 2mm too small in diameter which may or may not be an issue depending on your viewpoint while the "flat spot" makes them look even smaller. As with the previous sets each wheel has the hub orientated differently in relation to the ground contact plug point so they don't look the same on the kit and there are also different wheels with the tread orientated to represent the handed tread pattern for fitting to the left and right sides of the vehicle so take note when trimming off the pour plugs. This set is designed primarily for the Trumpeter Smerch kit (01020) and represents the newer hub style as seen on recent photos of the Smerch. 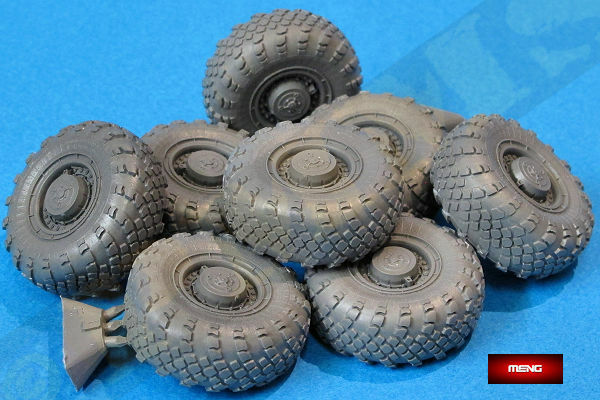 The set have eight tyres with separate two part rims and is cast in light grey resin, see full review for added details. The average wheel diameter 41.5mm and this was measured using the same procedure as for the others and being just 1.5mm undersized, while the tyres have a flat spot at ground contact and no sidewall bulging, as seen in numerous photos not depicting the bulged effect. The overall diameter is an issue but the plus with this set is depicting the latest hub design as seen on recent photos of the Smerch. Lastly this set from Voyager Model has the eight wheels cast in a light cream resin with just the small casting plug to be removed with the wheels cast perfectly round with just a small flat spot after trimming off the pour plug. The tread pattern is the early style which restricts their practicality for some of the later vehicle types. The set is marked for "generic" use but the rear has the mounting for the Dragon kit but again fitting to any other kit would only need some minor mods. The average wheel diameter 42.0mm and this was measured using the same procedure as for the others and being just 1mm undersized is probably not a lot to worry about as the lack of 'bulging' has them 'sit' a little higher when fitted than those with the flat bulged effect. 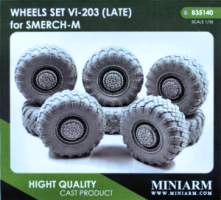 There are two types of wheels with the tread pattern correctly orientated for the handed pattern applicable to the left or right side of the vehicle (these are marked 1 and 2 on the casting plugs) but unlike the other sets the hub detail on the four wheels for each side is the same giving the wheels a uniform appearance when fitted to the kit. Wheel details, early tread pattern. Def Model: 43mm average diameter. ET Model: 41.5mm average diameter. Meng Model: 41mm average diameter. Note those with ground contact 'flat spots' have been rotated to show the actual diameter uncompressed. As you can see the Def Model wheels are spot on for diameter and the hub and tread detail is excellent without any blemishes with the tread pattern correctly handed for left or right placement and these are clearly the first choice for any of the available kits, with the added bonus of either the early or later tread pattern tyres available. The Voyager wheels are only marginally undersized in diameter and this is probably not that noticeable. They are cleanly cast again with the correct hander tread pattern but being the early tread pattern does restrict their application. Both the sets from ET Model and Meng sets are marginally smaller again at 1.5mm/2mm undersized are the least accurate dimensionally. You may say "just 2mm that's not much?" and it may not be in the overall scheme of things but visually they are more noticeably than the dimensions indicate as the wheels are a major feature of these kits with the fit/sit in relation to the fenders is noticeable but again this is up to the individual to make the final assessment. As both are basically reproductions of the Meng kit wheels their application seems primarily to be with that kit. 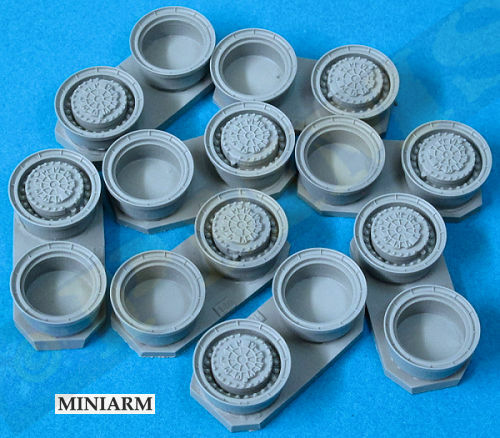 The new Miniarm set is also 1.5mm undersized in overall diameter but as mentioned depict the latest hub design as seen on recent photos of the Smerch. After all that the Def Model wheels appear to be the optimal choice given they have both early and later tread patterns available, are dimensionally correct with the correctly handed tread pattern, the bulged effect notwithstanding.